Hibernest Chembra in Wayanad wins for the view, the price and for the homely feel. Book a bed in this place for just INR 800 and get away from all of the noise, headaches and rush of the city. 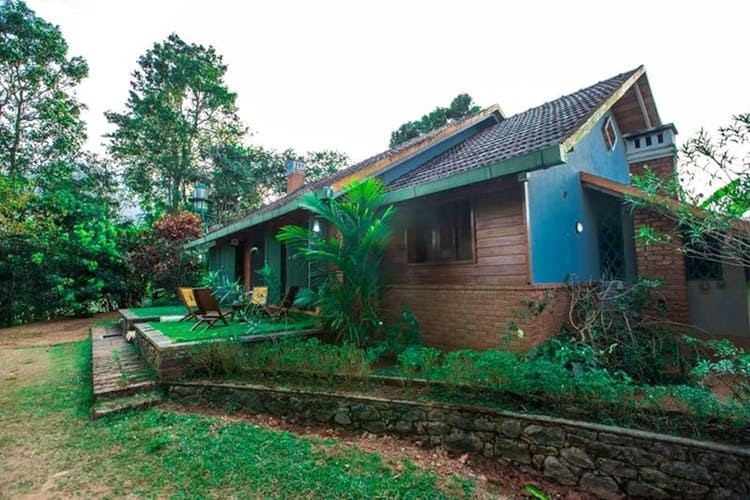 A colonial bungalow turned into a beautiful hostel, Hibernest Chembra is located at the foothills of the Chembra peak in Wayanad. With its brick exterior and teal doors and windows, the house immediately seems like it is opening its arms wide open just for you. Surrounded by greenery and a view to die for, this hostel is perfect for solo travellers, backpackers and anybody looking to get away from the city life for the weekend. Intricate and minimal wall decor, plants all around and basic facilities like free Wi-Fi, cable TV and an attached kitchen make this place the perfect spot. A bunk costs around INR 700 a night here and all come with pillows, sheets, plug points and a light. Warm up by the fireplace with a hot cuppa or relax on the verandah and enjoy the view, amongst the green. The food isn’t offered by the homestay, but you can get your own ingredients and whip up a meal here. There are two rooms, with four bunks each that come with attached bathrooms and private showers. Head out of the homestay and trek to the Chembra peak, something everyone must do when they come to Wayanad. Visit the nearby Soochippara Falls, and maybe even take a dip in the cool waters. Adventure junkies can head to the Karalad lake for kayaking and even hook on to a zipline and speed across the lake. Go to 1980’s A Nostalgic Restaurant for some authentic Kerala food, beef roast and chicken biryani. You can book a room here.